When you’re stuck in the middle of a motorway traffic jam or think “I wish I could take a shortcut across that field but my car is built for an urban setting”, the chances are you might think it was better if you owned a tank. There a few problems with this. First of all, whilst you can buy decommissioned tanks (they won’t let you have one where the gun can still fire) from the ministry of defence you’re not allowed to take them on the road unless you have an HGV licence category H. However, if it has a clean MOT and L plates on it plus someone who has a full HGV licence sits with you, you can happily and legally drive it on the road in the UK. There is a quicker way you could go and have a Tank driving day and experience what it’s like to drive a tank with Armourgeddon. You also need to sort out the width and height restrictions and insurance might be an issue. Say you do go down this route how do you actually drive one? 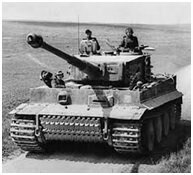 Tanks do not come with steering wheels (although the German Tiger 1 tank did but they are very hard to come by as most got smashed up in the Second World War). They are geared but it’s not just a simple task of turning the wheel left and right. They also do not have lovely big windscreens for you to see out of or wing mirrors. Some, but not all have a huge big gun and turret stuck on the top which makes reversing more fun than it should be and there is no camera in the back to guide you. On the other hand,if you do hit something like a wall of bollard you are definitely going to come off best. You will be faced with two sticks and 6 gears. 4 go forward and two do backwards. The tank needs lots of gears as it’s generally has to have them to spurt over hill and dale pretty quickly. Like a motorbike you “toe” the pedal up to go into the higher gear and back down when to want to be lower geared. Steering is easyin theory. One stick rotates the tank to the left the other rotates the tank to the right. Push them both forward and the tank proceeds forward, I expect that you knew that. Pull them both back and the tank goes into reverse (don’t worry about the gears those bits are automatic). Push one forward and pull the other one back and the tank will spin round like a mad thing and you’ll know what it’s like for a pair of trousers in a tumble drier. You won’t make a saving in the pocket either as they run on diesel and can consume 1.6 gallons per mile. There is the considerable environmental cost. If I were you I would stick to the tank driving experience day. It’s much easier.